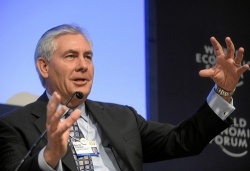 Rex Tillerson is the CEO and USA chair of the US's largest gas producer Exxon Mobil. ↑ Michael D. Shear and Maggie Haberman, Rex Tillerson, Exxon C.E.O., chosen as secretary of state, NY Times, 12 December 2016, accessed 5 January 2017. This page was last modified on 27 January 2017, at 14:49.